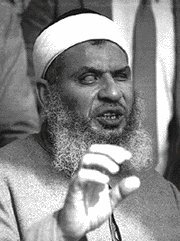 EBL: Is Obama negotiating to send World Trade Center terrorist Omar Abdel-Rahman back to Egypt? Breaking: Egypt just issued arrest warrants on Terry Jones and other Americans and Coptic Christians. Is Obama negotiating to send World Trade Center terrorist Omar Abdel-Rahman back to Egypt? Breaking: Egypt just issued arrest warrants on Terry Jones and other Americans and Coptic Christians. Is the Obama Administration this corrupt and depraved? Then again, I could see Axelrod floating this a false story to smear Republicans, and then Obama going through it after he is reelected. State Department spokeswoman Victoria Nuland responded as follows:. "Let me say as clearly as I can there is no plan to release the blind sheikh, there is no plan. To my knowledge we have not been approached about it recently by any senior Egyptians," she said Wednesday. That is their denial? What the hell! I agree with Ace, there has been discussion. Omar Abdel Rahman is the inspiration for the al Qaeda terrorist brigades in Libya that murdered the U.S. Ambassador. Egypt issues warrants for arrests of film makers? We should cut off aid to Egypt. Happy birthday U.S. Constitution. It was fun while it lasted. The LA Times is a disgrace. No one murdered over this image: Sorry Islam, learn to deal with it. If they kill a few more ambassadors, maybe they will get KSM too? Christopher Hitchens on free speech. Moe Lane: Do not do this!